When renting out an apartment or rental unit you’ll want to make it look as appealing as possible to the prospective tenant. While you’ve probably considered improving the interior of the apartment, chances are you haven’t spent as much time on the outside. Unfortunately, many tenants will judge their new home by its exterior. If the outside doesn’t look nice enough, a renter might not even schedule a showing. Because of this you’ll want to put extra time and effort into making sure that your rental looks as great from the street as it does from the kitchen. One of the simplest, easiest ways to make your rental stand out is to paint the front door. If your door’s paint is chipped or faded, a fresh coat can make it look much nicer. Another option would be to paint the front door a bright color so that it contrasts nicely with the color of the siding. Is your yard overgrown? Does it look more like a jungle than manicured garden? It might be time to trim back your shrubbery. While you don’t need to remove your bushes and hedges, you should make sure that they look neat and tidy. This will demonstrate to potential tenants that you take good care of the property grounds. If the outside of your property looks nice, renters will assume that the inside looks good as well. 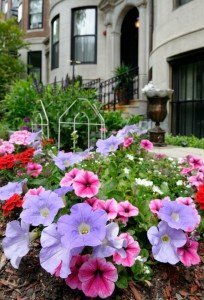 Another simple way to get renters interested in your location over the competition is to plant fresh flowers along the walkway. Make sure that you plant flowers that have already blossomed, rather than seeds that will take time to grow. A renter wants to imagine themselves living in your home. If the brass on your front door knob is faded or the door knocker is a different color than your doorbell, it may be time to update your fixtures. Consider purchasing a new doorknob or handle, new locks, and even a new doorknocker that all match. Not only will this make everything look more uniform but it will also make your front door look fresh. One of the simplest adjustments that you can make to your rental is to update your address numbers. No, this doesn’t mean that you need to assign your rental a new address. This simply means that prospective tenants and their guests will want to be able to view the number on the front of your house easily. If your number is faded, broken, or falling down, you can quickly improve your home’s appearance with new numbers. If you choose to hang metal numbers, make sure that they match your front doorknob and door knocker. If you utilize wooden, painted numbers, they should match the front door or the trim of your home, but should not be the same color as your siding. Make sure that you can clearly read the numbers from the street, as potential renters won’t want to struggle to see which location they’re at.